Moshin Vineyards is located in the heart of the bucolic Russian River Valley in Sonoma County California. The winery features four tiers for gravity-flow production and is set on a gentle sloping property along historic Westside Road – a rural winegrowing area famous for stellar Pinot Noir. The winery guest suite is a studio apartment with private entrance located within the winery building just behind the tasting room. The Russian River is located just across the street from the winery and has walking paths all the way to the beautiful Wohler Bridge, which was built in 1922. To the east of the winery are two of our estate vineyards covering approximately five acres. 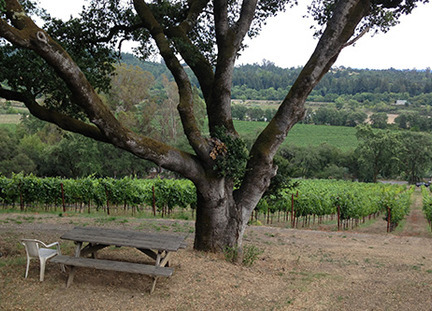 At the top of the Rosalina Vineyard is a viewing area and picnic table – perfect for a lunch outing or quiet reflection. Also on the property is the home of Moshin Vineyards’ founder, Rick Moshin and his wife Amber. It is not uncommon to be invited to an impromptu dinner with a selection of Moshin wines from Rick’s personal cellar. Close by is the hamlet of Forestville (5 min. drive) which features a handful of nice restaurants, a grocery store, post office and gas station. 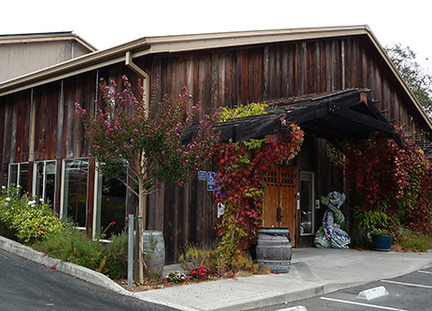 The delightful town of Healdsburg (15 min. drive) is north of us and is a veritable cornucopia of dining options. You can find world-class restaurants, a movie theatre, grocery, art galleries, tasting rooms and much more here. Please Note: All retreats at Moshin are 5 days in length. Furnishings provided: Full kitchen equipped with coffee maker, microwave, and refrigerator. Additional Details: NOTE: Cottage is located adjacent to tasting room, there may be noise occasionally during business hours. Moshin will host a reading event on the Sunday of arrival for all residents. Applicants please be prepared to participate in the hosted salon the first afternoon of your arrival. Details regarding event and time will be arranged with writers upon acceptance and prior to arrival. All other time during the retreat is reserved for the writer to work on projects with focused time alone.